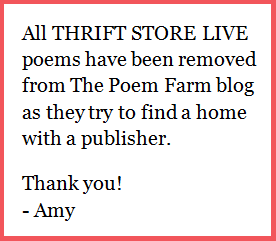 Students - Today is a thrift store free verse day. I have been writing free verse poems on the days that are multiples of five this month: #5 - Clock, #10 - Dancing Shoes, #15 - Two Couches, and #20 - Record, and #25 - Duck and Doll. Today, the 29th, is not a multiple of 5, but tomorrow is. Because tomorrow's poem is the last day of the month and thus, the last day of this series, I want to rhyme it. So I traded yesterday's free verse day with today. See, when you invent a project...you can change the rules whenever you wish! Today's poem does not rhyme, but it does repeat. Did you see how the first and last stanzas are the same? This is a circular poem, with the ending going back to the beginning. It's also a mask poem, with the blocks doing the talking! Which other poems from THRIFT STORE LIVE have been mask poems? One way to learn about writing poems is to pay attention to techniques you find in the poems you read. Just yesterday on Twitter, I saw Deb Frazier's first grade students reading like writers, noticing some of the techniques I used in "Snowman Slippers." Today I was thinking about Margaret Wise Brown's THE IMPORTANT BOOK. This may be why I began the poem, "The truth about blocks is..." If you remember, she begins each page of this book with the line, "The important thing about a spoon (or something else) is..."
Tomorrow will be the last day of THRIFT STORE LIVE, my April 2014 poetry project, and shortly thereafter I will be taking these poems down so that I can reread, revise, add, subtract, and try to pull them into a collection for hopeful submission. 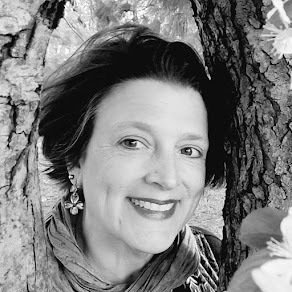 Today I am so pleased to welcome Kimberly Roark, Elementary Language Arts and Social Studies Coordinator of the Pflugerville Independent School District in Pflugerville, Texas, as she generously shares about the district's annual WRITE STUFF anthology and writing event! 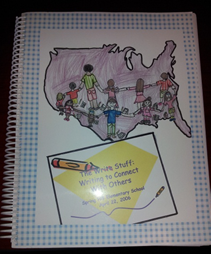 In Pflugerville ISD, student expression is celebrated through the annual WRITE STUFF event. Students at every grade (K-12) have the opportunity to submit pieces of writing, either poetry or prose, to be published in a district anthology. 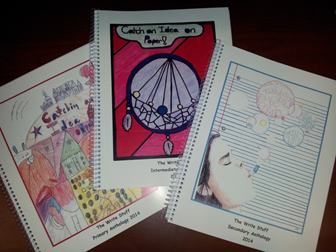 Student artwork related to the year’s theme is also included on the anthology covers and as inserts. All participating students are invited to attend a special Saturday event, where they receive a copy of the anthology. At the Write Stuff event, elementary students listen to local children’s authors and illustrators share their own experiences with writing. These younger students also have an opportunity to read their pieces to each other. Secondary students participate in a longer workshop session with a local young adult author. This year’s visiting authors/illustrators are Chris Barton, Mark Mitchell, and Jennifer Ziegler. The Write Stuff has been a Pflugerville tradition for over ten years. Originally, one anthology was sufficient to hold all of the entries for the entire district. As more students participated, a second and then a third anthology were needed. 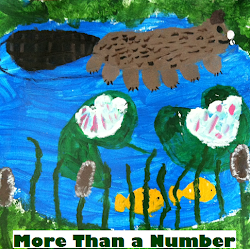 This year we published a secondary anthology with 229 entries, an intermediate elementary edition with 177 entries, and a primary version with 118 entries. This year, we included all submissions which follow the guidelines and are age-appropriate for the audience of the anthology. In past years, if the book became too large, we would limit submissions to one per student. Fortunately, this has not happened since splitting the K-5 book into two anthologies. With the increased emphasis on poetry in the district curriculum over the last few years, the number of students submitting poems continues to rise. 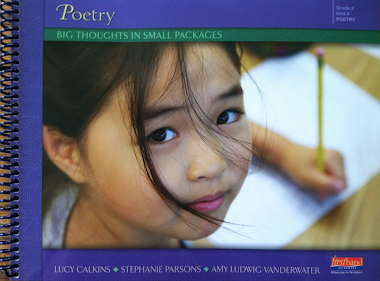 The current anthologies contain a total of 216 poems by students of all ages. Students are expected to take their pieces through all stages of writing. Though they receive guidance from teachers, the submissions represent the students’ best efforts with drafting, revision, and editing. Here are a few poems from this year's WRITE STUFF in Pflugerville. I have a tree in my backyard. Its beautiful trunk, sways in the wind. Its branches, with their big leaves, reach for the sky. Its awesome green leaves, stretch out for the ground. Its alive brown trunk is as thick as me! Every critter lives in my tree. There’s gone my last penny. the days I live for. Say I didn’t have a nice life. All I did was, but, at least, I was respected. And I’ll live like a king . . . . I wish life was more than this for me. Start advertising the anthology early. Have clear formatting expectations for submissions. Work with your copy center or wherever you will get the books bound to develop a reasonable timeline. Ask local companies to donate copies of one of more books by the visiting authors to school libraries to help promote the event. We have one label for each anthology to help keep track of which students have picked up books. Debrief immediately after the event to determine what went well and what changes need to be made next year. 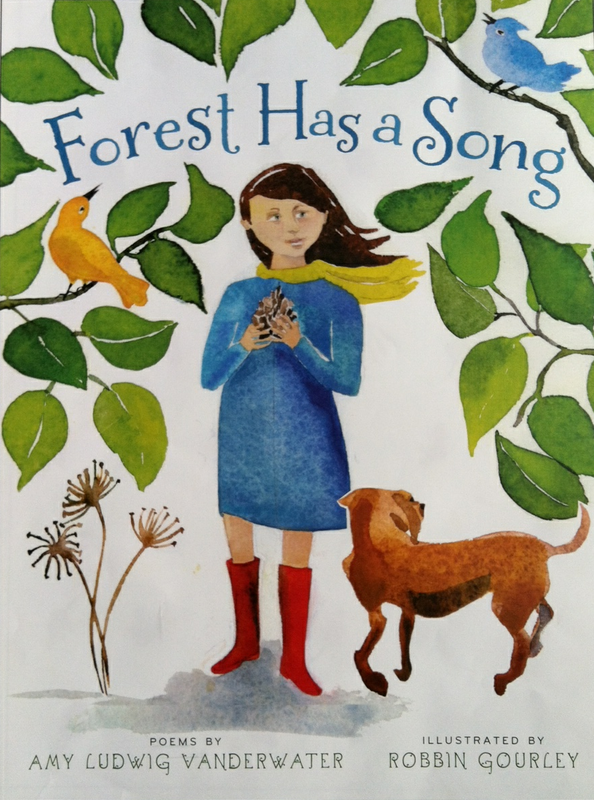 Much gratitude to Kimberly and these young poets for sharing this wonderful book, event, and lushly image-rich poems with us today. Remember, you can still leave comments on Saturday's "Violin" to be entered into the last book giveaway of April 2014. I will draw names this evening for those books, to be announced in tomorrow's post, the last post of this year's National Poetry Month series! Enjoying your poetry project, Amy. April Awakenings is on its way to being showcased. One more entry to go. I agree...you can never have too many wooden blocks. The anthology project is a super one. Glad it is an annual project. You are good at free verse, but imho, you are just the queen of rhyme! The truth about blocks is you can never have enough of them. Love it! 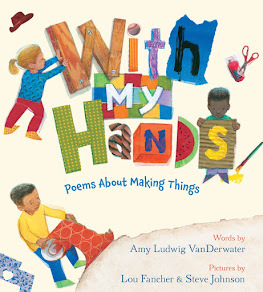 We (my students and I) loved the way your crafted this poem sharing in each stanza a way blocks can be used. You inspired many poems here.